Uppersia Iran Travel blog: Ramsar, the heaven on the earth! Ramsar sits between the endless Caspian Sea and the high Alborz Mountains covered in dense and foggy forests. This city offers you possibly the most beautiful landscape with fresh rainy weather and a cool breeze passing over the Caspian Sea. It seems like this city is made for walking and a long avenue of palm trees which connects Ramsar’s Grand Hotel to a wild rocky beach is known as one of the most beautiful spots in Ramsar. Javaher Deh (the jewel village), a scenic village near Ramsar, is located over the clouds! The road to this stunning village is a mountain pass, crossing through the foggy forests. The picturesque nature, its fresh weather and the nice local people who have retained their simple life have drawn many tourists and nature lovers to this small village. The gondola lift of Ramsar is a unique one in the whole Middle East, connecting the beach to the mountain forests, where you can enjoy the beautiful confrontation of the forests and the endless Caspian Sea, at a glance. The most adventurous activity that can be done in Ramsar is caving in the four spectacular caves around the city. The Gor Gor Luka rocky cave, the Yaghi Luka with a 95-degree steep, Shabpare which is home to many bats and Bam Bame which is 130 feet deep, are good choices for an exciting caving while you are in Ramsar. 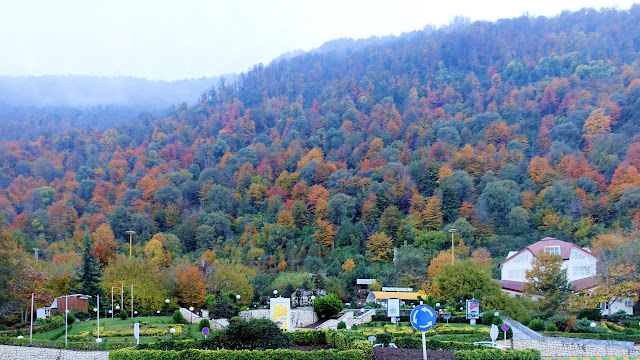 The beautiful city of Ramsar in autumn.